Feeling bullish? Excited about auto sales after headlines like these? 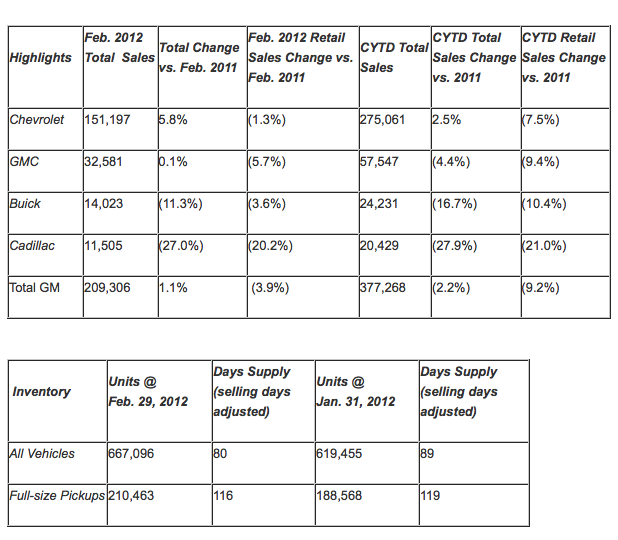 Notice the 3.9% year-over-year decline from Feb 2011? How about the 2.2% decline versus ytd 2011? They’re made all the more negative when you consider the channel stuffing going on. Channel stuffing, for those who aren’t familiar with the term, is forcing sales through dealer channels even though there’s no demand for them. It’s deceptive. Period. 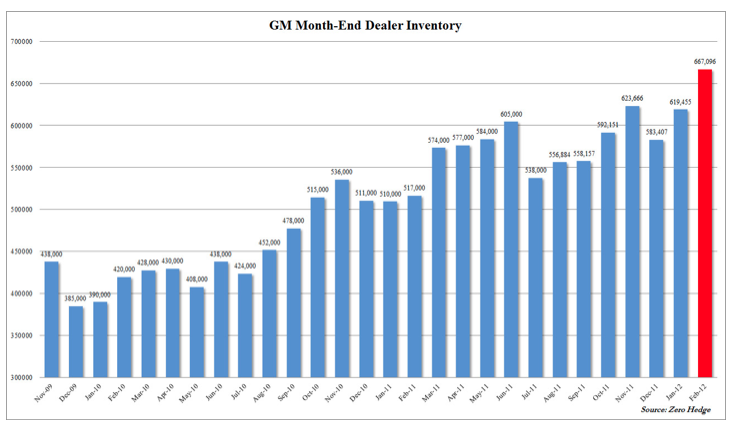 Dig into the numbers a bit, and the 30,410 fewer vehicles sold ytd in 2012 versus 2011 is positively dwarfed by the 150,096 increase in inventory since a year ago. 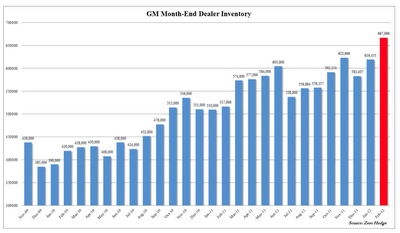 The month-over-month increase of 2,278 vehicles was crushed by the 47,641 inventory increase. I get tired of saying it, and you’re probably tired of hearing it, but financial reporting has become largely a confidence game. 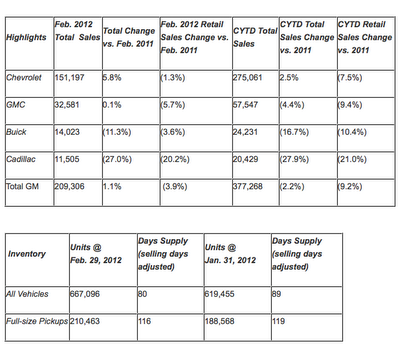 Companies like GM have no compunctions about blurring, shading, or even outright lying about their results. And, the mainstream media has absolutely no problem reporting this crap as gospel. Why? Because good news is good for markets. And, strong markets are good for bank, brokerage and investment banking profits. You know, the same guys who buy all those ads in the WSJ and on CNBS. Even (some would say “especially”) our government encourages this outrageous conduct. Rising markets virtually guarantee reelection; it ain’t folks who emptied their 401(k)’s to pay the rent that contribute to campaigns. The SEC used to care, and would occasionally prosecute someone for lying to investors. Now, it’s up to the blogosphere, fringe guys like me who are drowned out by the incessant bullish drumbeat of the Murdocks and Buffets of the world. Like all good soothsayers, I take this responsibility seriously. But, there’s just too much for one person to keep up with. So, check Zerohedge, ShadowStats and Mish daily. And, ignore us tin foil hat wearers at your own peril. 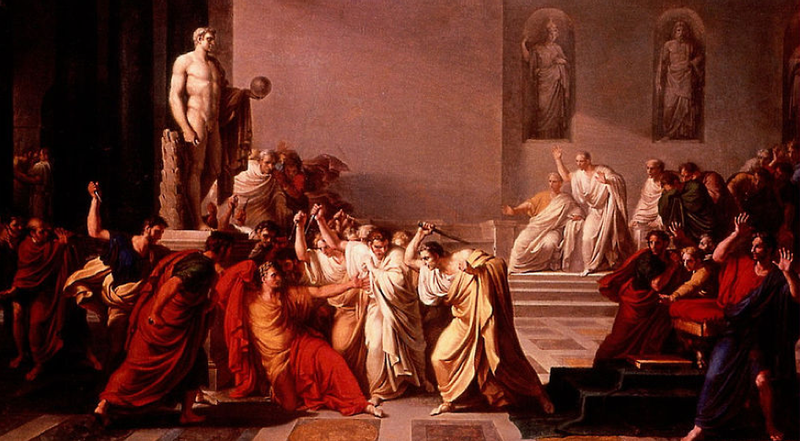 As Julius himself would tell you, better safe than sorry. Just want to say TYVM for all you do! Insightful and helpful! Yeah, I'm on the very same train too, IWM puts, and VIX calls. With the VIX so low, downside is so limited -aside from decay, with good potential upside to 24/25, and maybe IWM as low as 76. The beauty of it is though, if the stocks go down, the US Fed can just bail out the Israelis with a check! What a great system we are part of. Sigh. More deception from a failed company. 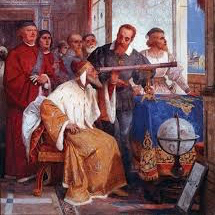 The moment GM was resurrected from the dead by his highness, I proclaimed they'd eventually go under…again. Give it 2-3 years, and GM will be under again. The only mystery remains whether dear leader -whomever that might be at such future time, will have the insane guile to again throw more money at a bloated poorly run corporate pig. Today was clearly a let-down. In the meantime, the news and chatter – including from this site, is always VERY interesting and useful to browse. I do hope you don't disappear into the dark web, like so many others. Am really getting tired of seeing it happen. I read this and still can't believe it. I really can't. Straight up market intervention… or setting themselves up to purchase cheap stocks. Either way, it's unbelievable… and wrong! Lotta money thrown at /ES and /NQ into the close. How the heck do you get a 43% increase out of those numbers? That means that anything sold larger than a small car cliff dived over the last year. Yikes! Anyone watching GOOG should know that the CEO Eric Schmid just sold nearly 100,000 shares for a cool $57 million. I'd like it more if the inception were at the Jan 2 high, but there is a completed Gartley pattern on GOOG over the past seven sessions. Do you suppose this puppy might sell off a little in a general market decline? As we approach 1380, I've purchased 10 more VIX Mar 19 calls at 2.40 and 10 IWM (Russell 2000) Apr 80 puts at 2.19 in our model portfolio.